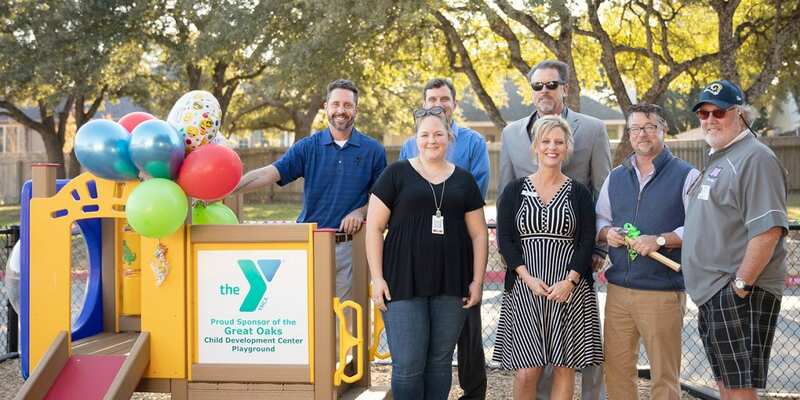 Great Oaks Elementary School Child Development Director, Sarah Cleveland is thrilled to have an updated playground thanks to a generous donation of $20,000 from the YMCA of Greater Williamson County. With the YMCA’s gift and matching funds from the District, the campus’ youngest students now have new equipment to run, jump and play. Round Rock ISD has two full-time, licensed child development centers (CDCs) for teen parents to use while they are in school. The daycare centers are housed at Great Oaks and Success High School. Students pay no fees for childcare services but are expected to attend and pass their classes to be eligible for childcare. When asked why the YMCA chose to allocate funds to the Great Oaks Child Development Center, YMCA CEO Jeff Andresen said the answer was simple. The mission of Round Rock ISD and the mission of the YMCA are aligned. Both want to take care of the kids in our community. Round Rock ISD and the YMCA have a 37-year history that began with after-school care at a handful of elementary schools. Over the years, the partnership between the two organizations has grown exponentially. The YMCA not only provides after-school care for all of our elementary schools, but they also host field trips at their Camp Twin Lakes site, teach swim safety to elementary students, and donate supplies and volunteer at the District ’s school supply distribution event. Superintendent Steve Flores, Ph.D. says the partnership with the YMCA is invaluable.